Definition at line 287 of file commctrl.h. Definition at line 289 of file commctrl.h. Referenced by cd_wndproc(), custom_draw_wnd_proc(), customdraw_1(), customdraw_2(), customdraw_3(), customdraw_4(), CTaskSwitchWnd::HandleToolbarNotification(), HEADER_DrawItem(), HEADER_SendCtrlCustomDraw(), ListViewCustomDraw(), notify_customdraw(), CMenuToolbarBase::OnCustomDraw(), CBaseBarSite::OnCustomDraw(), CSysPagerWnd::OnCustomDraw(), parent_wnd_proc(), REBAR_DrawBand(), subclass_proc(), TestProc(), TOOLBAR_DrawButton(), TOOLBAR_EraseBackground(), TOOLBAR_Refresh(), TOOLTIPS_notify_customdraw(), TREEVIEW_SendCustomDrawItemNotify(), TREEVIEW_SendCustomDrawNotify(), ViewDlg_OnTreeCustomDraw(), and WndProc(). Definition at line 292 of file commctrl.h. Referenced by customdraw_fill(), HEADER_DrawItem(), HEADER_SendCtrlCustomDraw(), notify_customdraw(), CMenuToolbarBase::OnCustomDraw(), REBAR_DrawBand(), TOOLBAR_DrawButton(), TRACKBAR_Refresh(), TREEVIEW_SendCustomDrawItemNotify(), and TREEVIEW_SendCustomDrawNotify(). Definition at line 290 of file commctrl.h. 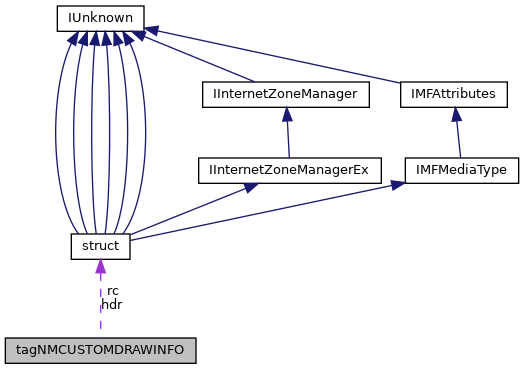 Referenced by cd_wndproc(), customdraw_fill(), HEADER_DrawItem(), HEADER_SendCtrlCustomDraw(), LISTVIEW_DrawItemPart(), CMenuToolbarBase::OnCustomDraw(), CBaseBarSite::OnCustomDraw(), parent_wnd_proc(), REBAR_DrawBand(), TOOLBAR_DrawButton(), TOOLBAR_DrawFrame(), TOOLBAR_DrawImage(), TOOLBAR_DrawPattern(), TOOLBAR_DrawSepDDArrow(), TOOLBAR_DrawString(), TOOLBAR_EraseBackground(), TOOLBAR_Refresh(), TOOLTIPS_customdraw_fill(), TRACKBAR_Refresh(), TREEVIEW_SendCustomDrawItemNotify(), and TREEVIEW_SendCustomDrawNotify(). Definition at line 288 of file commctrl.h. Referenced by custom_draw_wnd_proc(), notify_customdraw(), TOOLBAR_DrawButton(), TOOLBAR_EraseBackground(), TOOLBAR_Refresh(), TOOLTIPS_customdraw_fill(), TOOLTIPS_notify_customdraw(), TRACKBAR_Refresh(), TREEVIEW_SendCustomDrawItemNotify(), and TREEVIEW_SendCustomDrawNotify(). Definition at line 294 of file commctrl.h. Referenced by customdraw_fill(), HEADER_DrawItem(), HEADER_SendCtrlCustomDraw(), ListViewCustomDraw(), REBAR_DrawBand(), TOOLBAR_DrawButton(), TREEVIEW_SendCustomDrawItemNotify(), TREEVIEW_SendCustomDrawNotify(), and ViewDlg_OnTreeCustomDraw(). Definition at line 291 of file commctrl.h. Referenced by customdraw_fill(), HEADER_DrawItem(), HEADER_SendCtrlCustomDraw(), LISTVIEW_DrawItem(), CMenuToolbarBase::OnCustomDraw(), CBaseBarSite::OnCustomDraw(), REBAR_DrawBand(), TOOLBAR_DrawButton(), TOOLBAR_Refresh(), TOOLTIPS_customdraw_fill(), TRACKBAR_Refresh(), TREEVIEW_SendCustomDrawItemNotify(), and TREEVIEW_SendCustomDrawNotify(). Definition at line 293 of file commctrl.h. Referenced by customdraw_fill(), HEADER_DrawItem(), HEADER_SendCtrlCustomDraw(), CMenuToolbarBase::OnCustomDraw(), prepaint_setup(), REBAR_DrawBand(), TOOLBAR_DrawButton(), TOOLBAR_DrawFrame(), TOOLBAR_DrawImage(), TOOLBAR_DrawSepDDArrow(), TOOLBAR_DrawString(), TRACKBAR_Refresh(), TREEVIEW_SendCustomDrawItemNotify(), TREEVIEW_SendCustomDrawNotify(), and ViewDlg_OnTreeCustomDraw().